The number of climbers attempting K2 is more than 125 which is more than double as compare to last year. 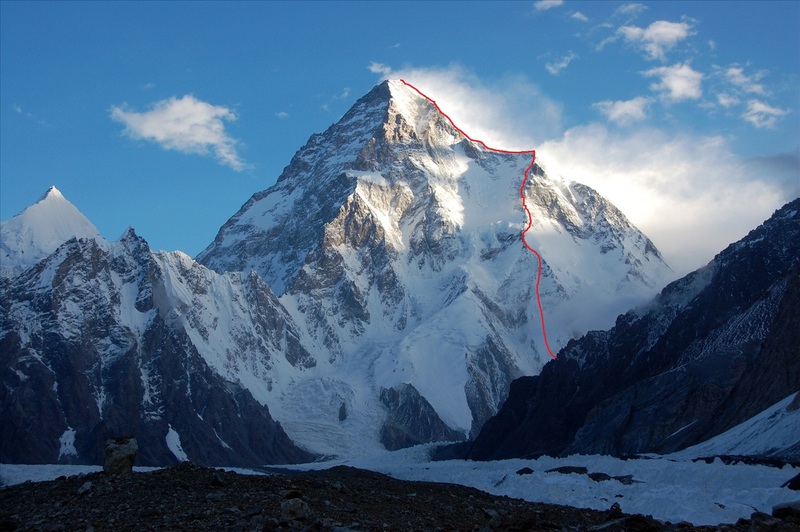 K2 is not Everest and cannot handle so much traffic, Camp 1 and camp 2 are on cliffs and there is not enough space to accommodate so many climbers. Himex and Swiss teams have figured out a way to avoid traffic and they are going on Cessen route. 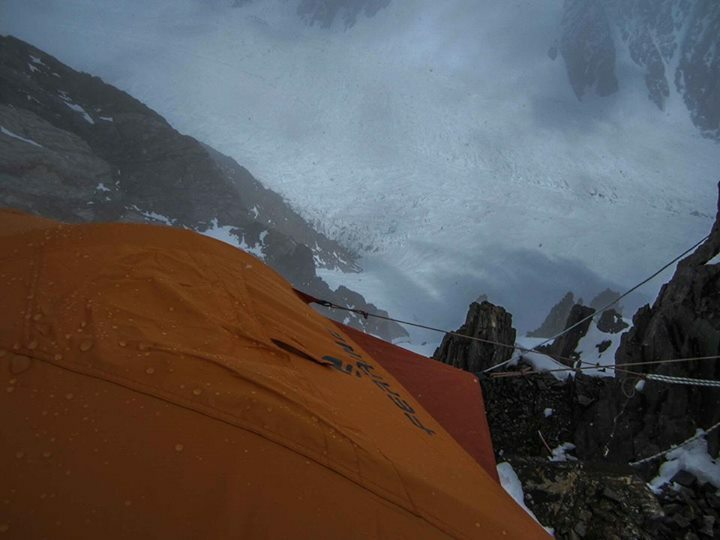 Sherpas reported good conditions and solid anchors while fixing ropes on the route. Cessen was first completed by Spanish expedition in 1994, and they claimed that route is easier than Abruzzi Spur. Many ascents are made via Cessen route since 1994. 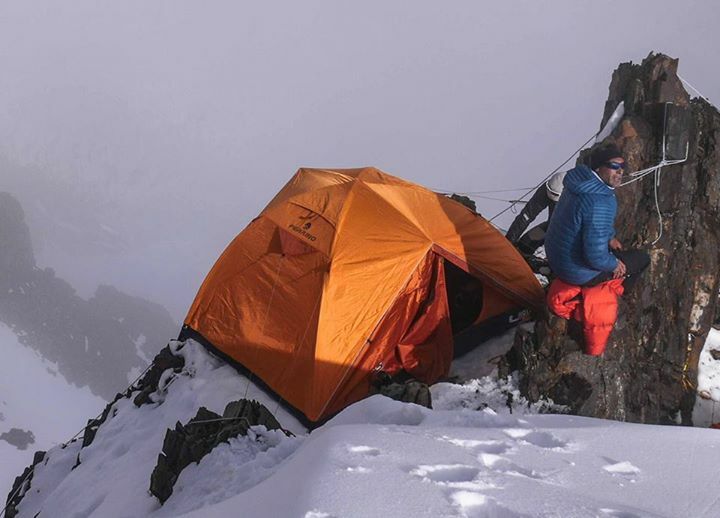 Here are few pictures of Camp 1 6000m on Cessen route uploaded by Mike Horn (Swiss Expedition) after their second rotation on the mountain. The camps are literally hanging off the cliffs, Russel Brice of Himex is considering to skip Camp 1 for next rotations. Seven Summits Expedition is also on the trek to K2 base camp, they reached Goro II today, tomorrow they will reach Concordia. Swiss Expedition was the first to reach K2 base camp; they faced deep snow, cold and frost in the base camp. Swiss team made first rotation on the mountain on June 28 when they reached almost 6000m and skied down due to avalanche danger. Mike and Fred Skiing down from Camp 1 of K2 on first rotation. They made second rotation on the mountain on July 1, when they spent a night in camp 1 6000m and skied down next day. 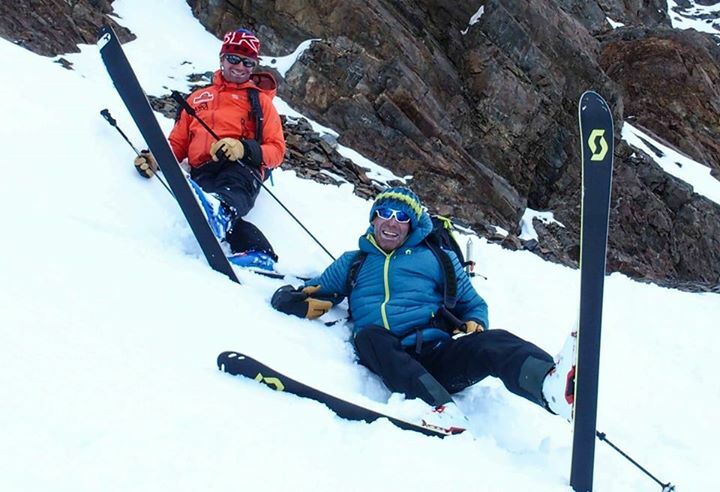 Swiss team reported deep snow, terrible conditions and high avalanche danger. They decided to wait until snow conditions improve. 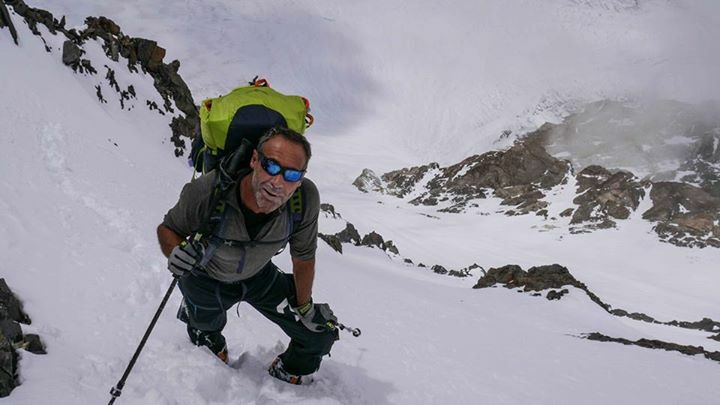 They reported four avalanches on July 2nd, they later concluded that mountain has dumped most of the snow so it’s right time to make 3rd rotation and complete acclimatization. Mike and Fred ascending to K2 Camp 1 on second rotation. Third Rotation: They started 3rd rotation today in the morning; they are in camp 1 6000 meters at the moment, they will leave tonight and try to reached Camp 2 7000m. 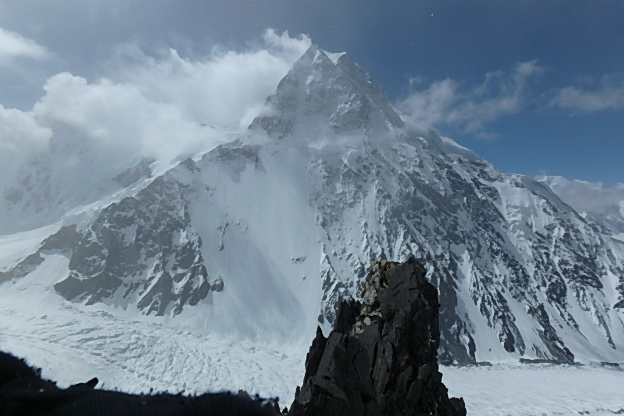 Himex Expedition reached K2 base camp on June 28; they also had a cold start at base camp. 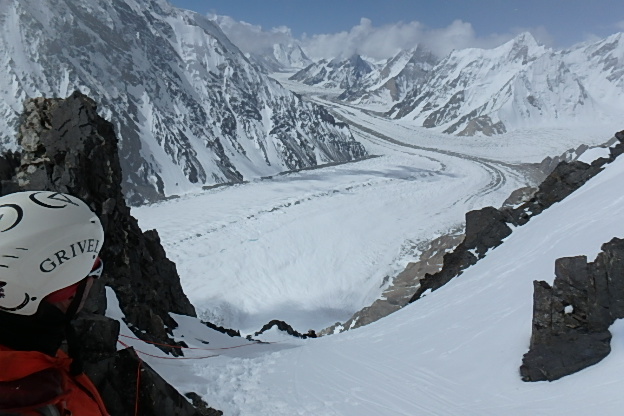 Himex have a large team of high altitude porters from Nepal and Pakistan who are fixing ropes on Cessen route. First Rotation: (Ropes were already fixed up to Camp 1) they reached Camp 1 6000m in two teams, first on July 1 and second on July 2. Some of the members decided to acclimatize on Broad Peak after huge avalanches from slopes of K2. Second Rotation on Broad Peak and K2: They started second rotation on July 4th to reach Camp 2 6500m and complete acclimatization. 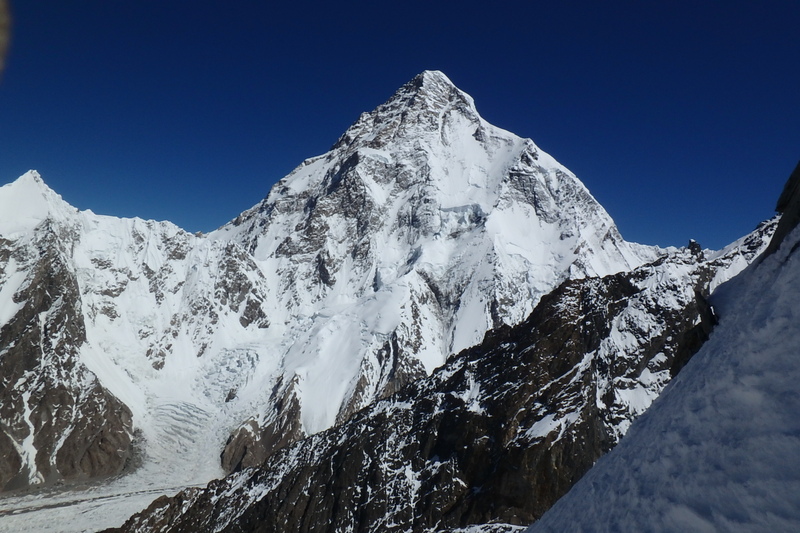 The team acclimatizing on Broad Peak reached camp 2 6200m on July 5th and they are now back in the base camp of K2. The team acclimatizing on K2, reached Camp 1 on July 4th, July 5th was rest day and today in morning they left for camp 2 for two nights. 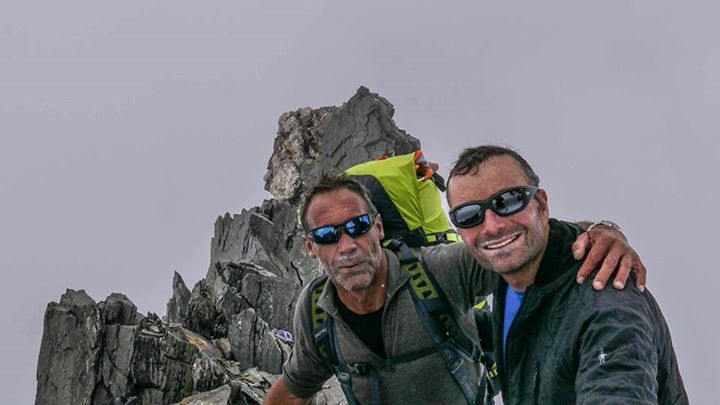 Lela Peak Expeditions team Expedition comprises: Spain team (Carlos Suarez and Jose Fernanddez), Argentina (Mariano Galvan) and Hungary (Szilard Suhajda and Varga Csaba). Reported by agency on July 3rd: Carlos Suarez, Szilard Suhajd, Varga Csaba, Mariano Galvan and Jose Fernanddez are ready for climbing. They left for camp 1 on July 4th, and they are back in the base camp now after spending two nights in Camp 1, will rest for couple of days and get ready for second rotation and camp 2.